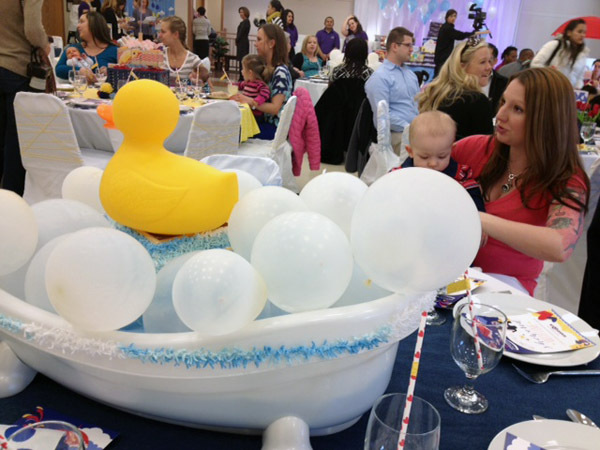 Operation Shower threw a baby shower for 40 expectant military spouses to let them know how much they are appreciated. ALEXANDRIA, Va. – It’s just another sacrifice that some military spouses endure when their loved ones are deployed: Going through a pregnancy — even having their babies — while their husbands are thousands of miles away. One group has taken notice and wants to do something about it. It’s Operation Shower, created in 2007. A group shower was thrown for 40 moms-to-be in Alexandria Thursday at the Collingwood Library and Museum on Americanism, inside the American Legacy Center. The moms-to-be were treated to a lunch and were later given gifts for themselves and their babies. Thanks to a $100,000 grant from Babies “R” Us, five such showers have been thrown across the country this year. Leann Morrissey, the chief planner for Operation Shower, says she got the idea when a relative went through a pregnancy while her husband was away on a deployment. The moms-to-be invited were thrilled. “I’m still kind of just amazed at the outpouring of support,” says Lacy Lichi. Her Navy husband is home now but soon heading out to the Gulf and will be gone much of her pregnancy. “I think it’s just neat to be around moms who are either were in the same situation as I am or going through it,” says Jessica Whitcomb. Her husband is already deployed and will miss the birth of their child. She says she’s privileged to be part of the event. The women were chosen by Operation Shower for a variety of reasons, including an injured spouse, a deployed spouse or because some other stressor added to their pregnancy.